This post was written by Tom Baird and appeared as a column in The Independent. Sometime after Muskrat Falls was sanctioned and before a new public sector labour contract is to be negotiated, our provincial government revealed that we are facing an enormous $4 billion deficit over the next three years. On Tuesday the government will release a budget that is expected to include deep spending cuts. 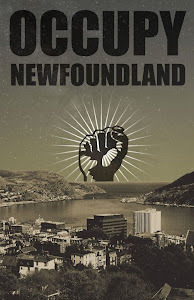 Thus begins a new era of austerity in Newfoundland and Labrador. How did this happen? So how did this happen? Talk has mostly centered on the expansion of the public sector and this is certainly an important part of the story. 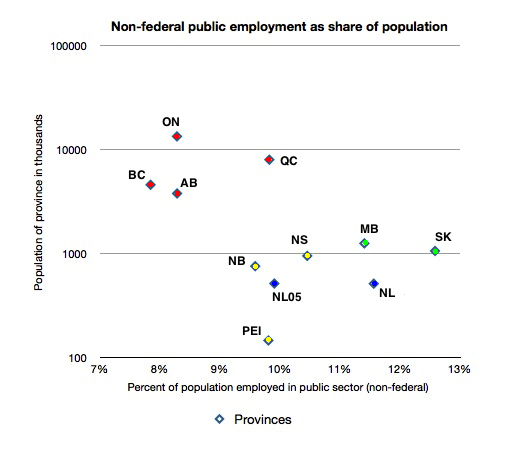 Below I have plotted public sector employment in the province, excluding federal jobs. 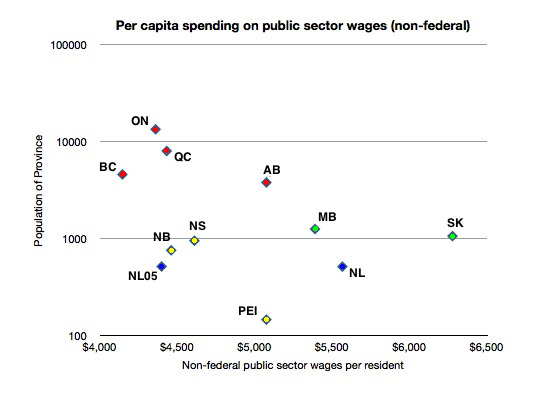 (All charts use data from Statistics Canada CANSIM table 183-0002). As you can see, the number of people employed in the public sector surged between 2005 and 2010. Over the same period, the number of private sector jobs actually shrank. Has the public sector gotten too big or was it too small in 2005? We can try to address this by looking at other provinces. Large provinces tend to have relatively small public sectors (likely due to economies of scale and urbanization) so it is more reasonable to compare us with other small provinces. 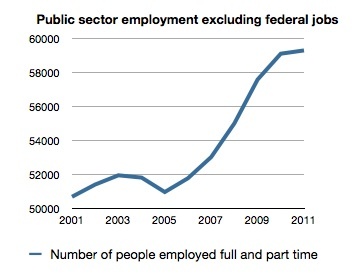 The chart below shows non-federal public sector employment as a share of the population in 2011. I also include Newfoundland and Labrador in 2005 so you can see the change. The red dots are the four provinces that are too large to be suitable for comparison purposes. We see that our province has moved from below average to above average for a small province since 2005. We get roughly the same story looking at wages, though the growth is more pronounced due to salary increases (adjusted for inflation for 2005). The charts above include employment in government business enterprises such as Nalcor and the NLC which are kind of grey area. If we exclude these, we get the following chart. By this measure we have gone from spending the least to spending nearly the most among small provinces. The numbers get more interesting if we look at subcategories of the public sector. 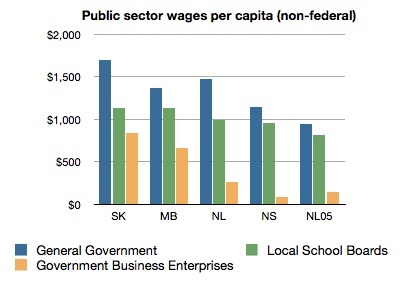 Our province spends a normal amount on general government (provincial plus local), K-12 schools and government business enterprises. 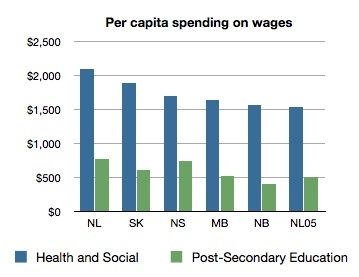 Our spending is unusually high on "health and social services" and "post-secondary education". In both of these categories we have gone from one of the lowest spenders to the highest spender in the country. If there is fat to be trimmed, this is where we should be looking. 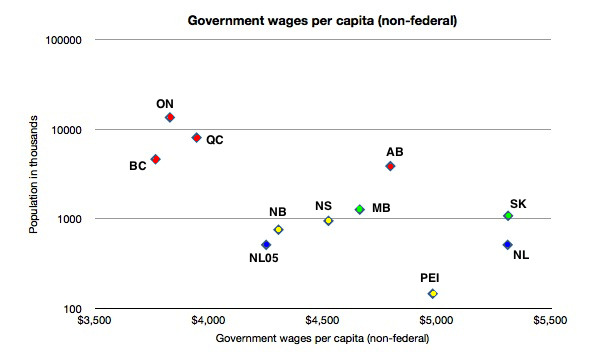 On the other hand, I think it is reasonable to argue (as this CCPA report does) that since our province has the oldest population and the highest unemployment rate, we really ought to be spending more than other provinces on health and post-secondary education. My own impression from studying the numbers is that our public sector has grown too much and too quickly, but that we are closer to the right level of spending now than we were seven years ago. I should also point out that wages are only part of government spending. Salaries and benefits account for about 45% of spending (pdf) and other categories of spending including grants/subsidies and operating costs have also been increasing. Reasonable people will disagree about what is the right level of government spending, but I think most people would agree that it is irresponsible to greatly increase spending while simultaneously implementing huge tax cuts. Yet this exactly what the government has done. Tax cuts since 2006 have reduced government revenue by about $500 million per year. These were mostly income tax cuts designed to benefit wealthy people much more than those with low and middle income. The tax rate for high income individuals has fallen from 18.02% in 2006 to 13.3% today, and is now the lowest rate among the six smallest provinces in the country. Over the same period, government spending on current expenses (which excludes investments in buildings, roads, and other infrastructure) increased by about $1.5 billion (adjusted for inflation). Combining these figures, the government is spending $2 billion more on current programs and tax cuts than they were 7 years ago. Oil royalties that have averaged around $2.5 billion recently, but the oil boom has also reduced federal equalization transfers by about $1 billion. Combined, this leaves us with about $1.5 billion in extra revenue compared to 7 years ago, a figure that is expected to decline in coming years. Subtracting $2 billion in tax cuts and current spending, this leaves leaves our budget position $500 million worse off than in 2006 despite the huge increase in oil revenue. Moreover, this figure completely neglects capital spending (including Muskrat Falls) which has tripled since 2006, adding another $500 million to the cash deficit. All this during a temporary oil boom when we ought to be running large surpluses. It is astonishing to hear this government present themselves as responsible stewards of the public purse when their policies have actually been incredibly reckless. I feel a little bad for the Premier (only a little) because most of these reckless decisions happened during the Williams era. I am finally beginning to understand why Danny was so popular: he spent several years blasting the province with a multi-billion dollar money hose and then left Dunderdale to deal with the fall-out. How do we deal with this nasty situation? First thing is to reverse some of those tax cuts that were not affordable in the first place. Our income tax rates should be at least average for a small province, which would entail an increase of around 2-4% for existing brackets, plus a new tax bracket on individual income above say $100,000. On top of this, we will have to cut public spending by something like $500 million per year. While there are some low hanging fruit out there (the baby bonus program costs about $5 million a year and doesn't serve the public interest) these cuts are going to be painful. If the jobs cuts take place in proportion to their share of the budget (about 45%) then my rough calculations are that about 4,000 jobs need to be cut. This assumes that real wages per employee do not change; if NAPE accepts wage increases below inflation then some of these job cuts could be averted. These cuts would have to be spaced out over several years to avoid flooding the labour market. Of course, alternative blends of tax increases and spending cuts could also work. The CCPA has proposed some version of a corporate tax to capture more profits from the oil sector. Scenarios that fix the deficit without tax increases seem truly dire, but I suppose they are possible. What I most want to impress upon you is the scale of the problem, which I don't think is widely understood. These numbers may seem drastic, but recognize that what I am proposing would still leave us with lower tax rates and more public spending than in 2006. 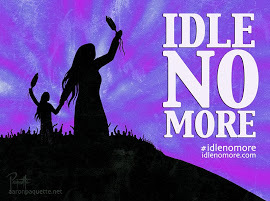 We are still a have province, we just don't have as much as many people thought. We have lived through a period of irrational exuberance and we will have to adjust to a new reality. This post was written by Tom Baird and will appear as a column in The Independent later this week.